Fun, custom projects I've created. If you would like something custom made, just for you, e-mail me and we can see what we can come up with! 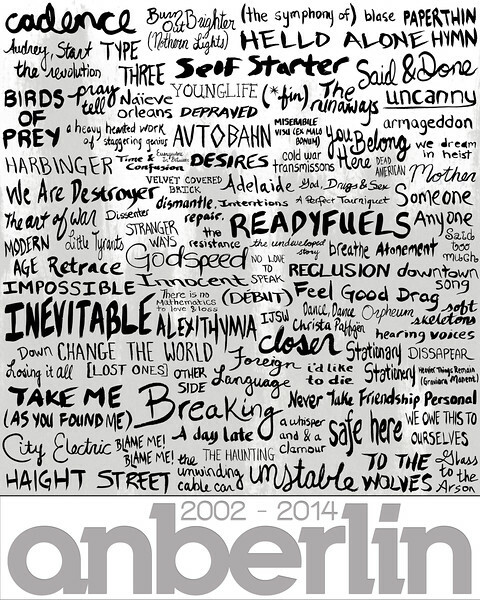 This was my entry into a commemorative 16x20 poster design for the band Anberlin. I wanted to focus on, and celebrate all of the amazing songs that Anberlin has created. I used tempera paint and brushes to paint each of their song titles. Then I scanned in each page of titles and put them together using Photoshop. I placed an opaque version of their 'Cities' album cover in the background.